I love Food in My Beard. He makes some of the most creative and original dishes I’ve ever read about. 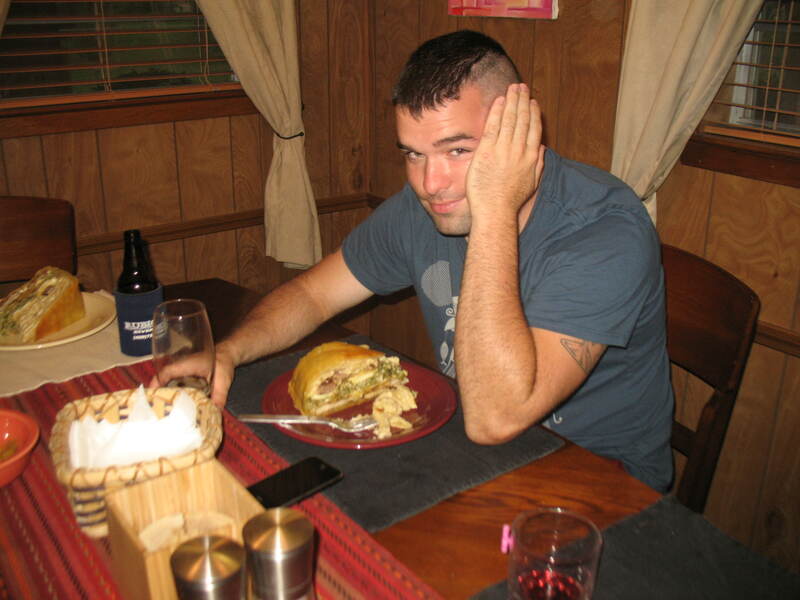 Every recipe of his that I’ve tried was a success (try the cheese steak!). 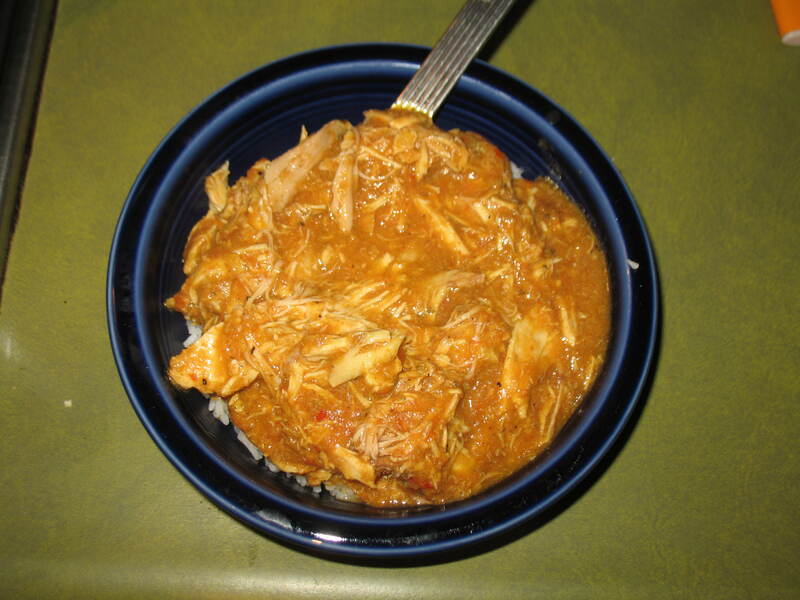 I read this recipe a while back and have always wanted to eat it. The lovely Lucy reminded me of it recently. 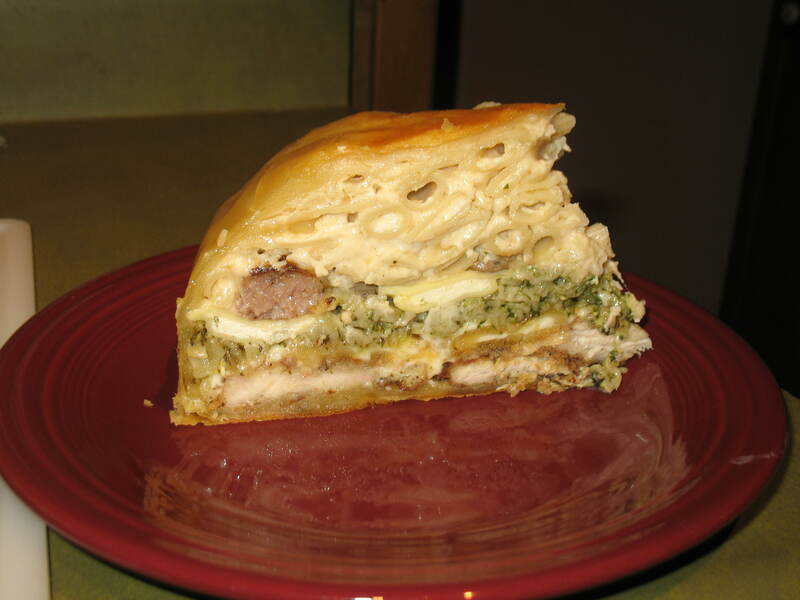 After some planning T and I came up with our version of that Epic Timpano. Since it contains so many elements this is more of a documentation of what we did rather than a recipe. So many carbalicious treats. 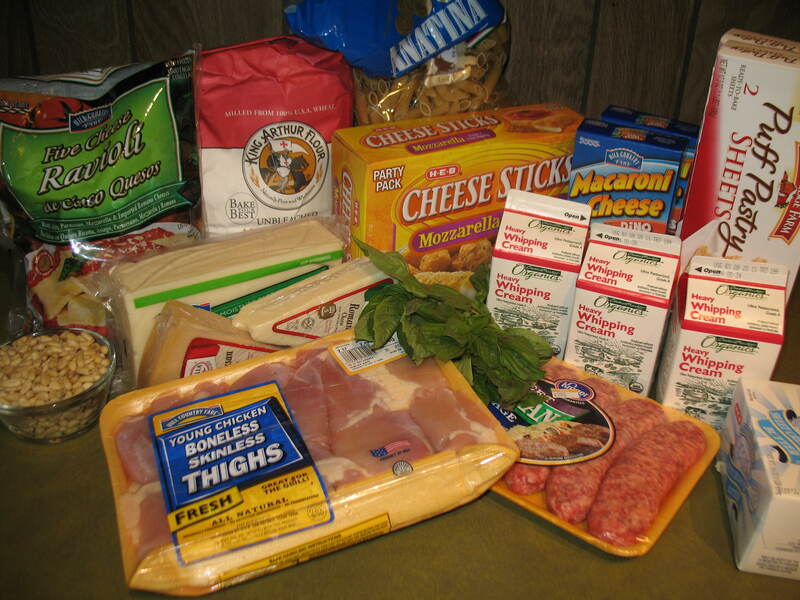 It’s been a long time since we’ve bought this much packaged food. 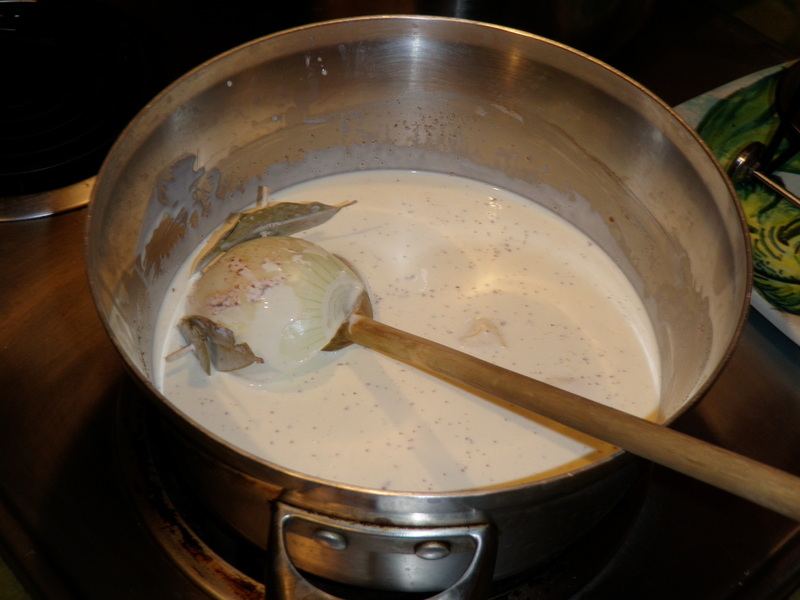 T made an amazing alfredo sauce using a béchamel sauce from the ‘Joy of Cooking’. Add penne and try not to eat it all before you make the rest of the elements. 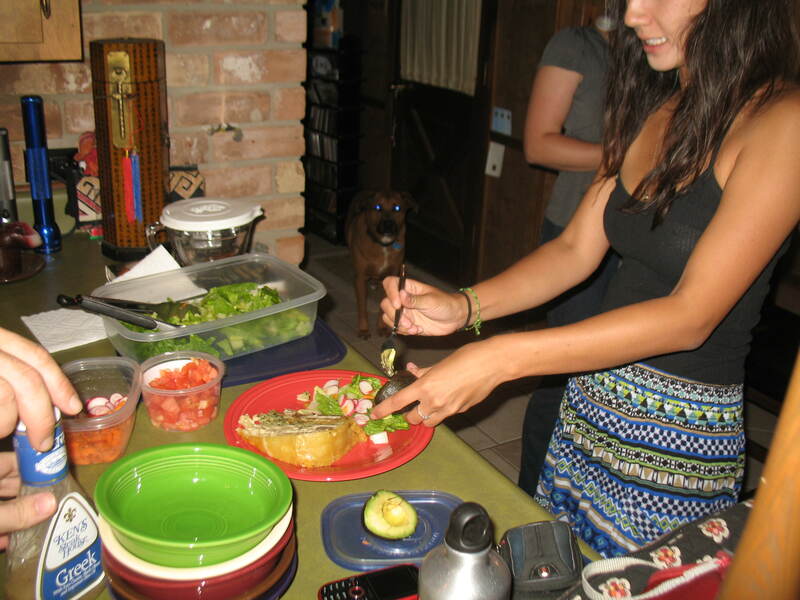 T also washed ALL the dishes, epic meals means epic dishes! I think our kitchen would be buried right now if it wasn’t for him. 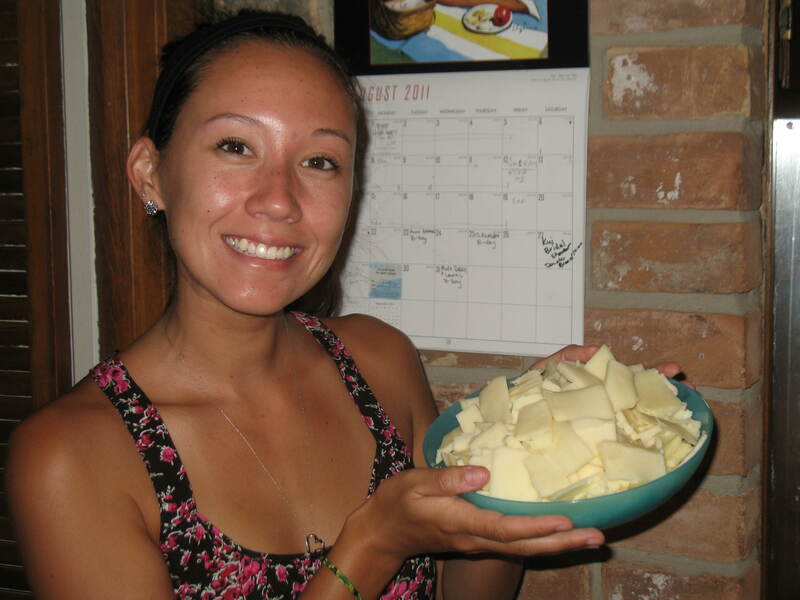 Maya grated and cut all our cheese, mmm cheese. Again try not to eat it all before you assemble all the parts. 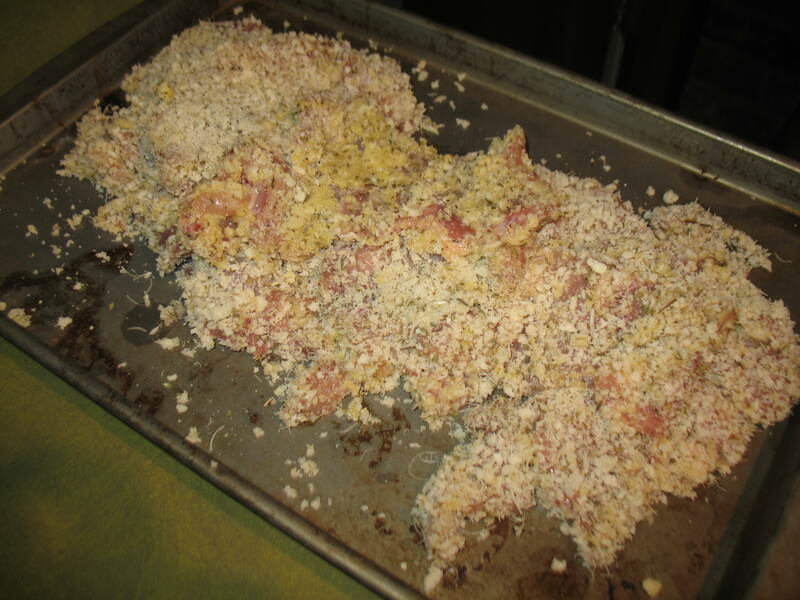 Once they were thin I breaded them with parmesan and panko. I added some garlic powder, thyme, and oregano to the panko. 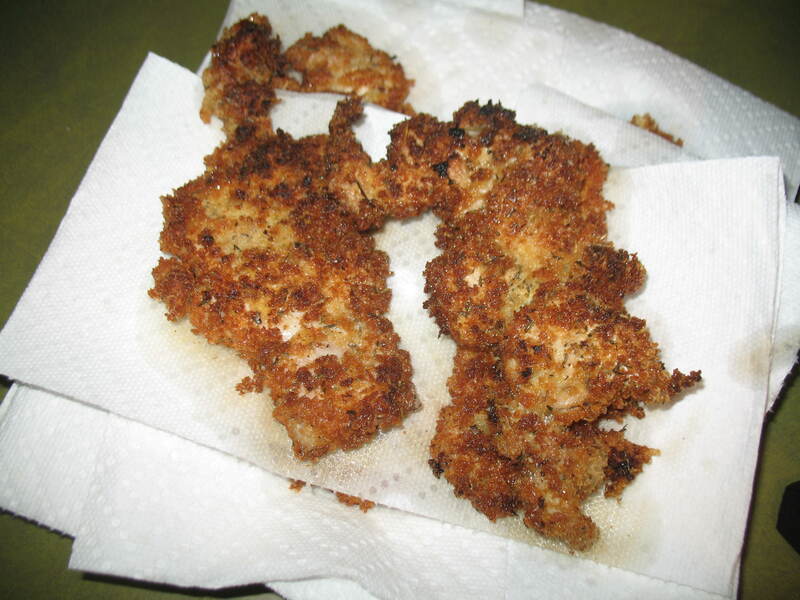 After I breaded them I fried them up in a pan and set them aside to cool. 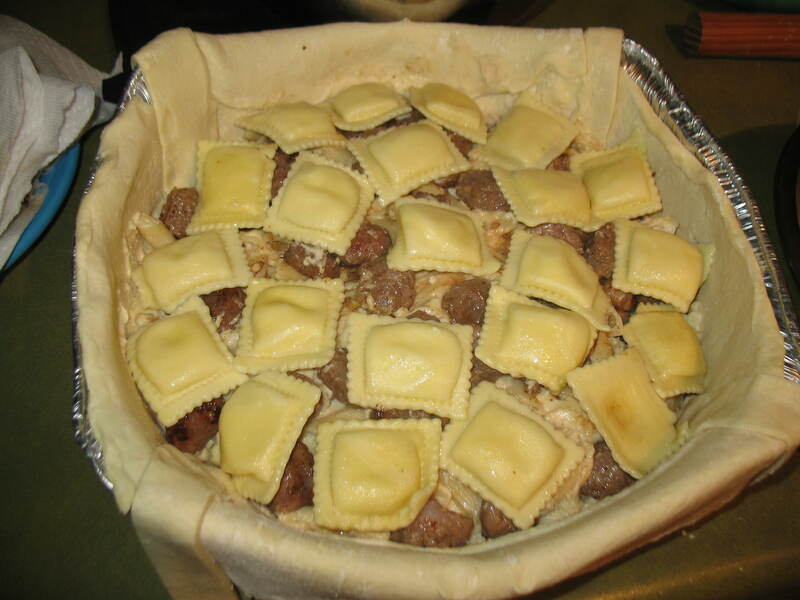 We cooked up some cheese ravioli and Italian sausages and set them aside to cool. T cooked up some cheese sticks in the oven. We never eat cheese sticks so we failed there. I think we should have fried them but the thought was baking would keep them less greasy. 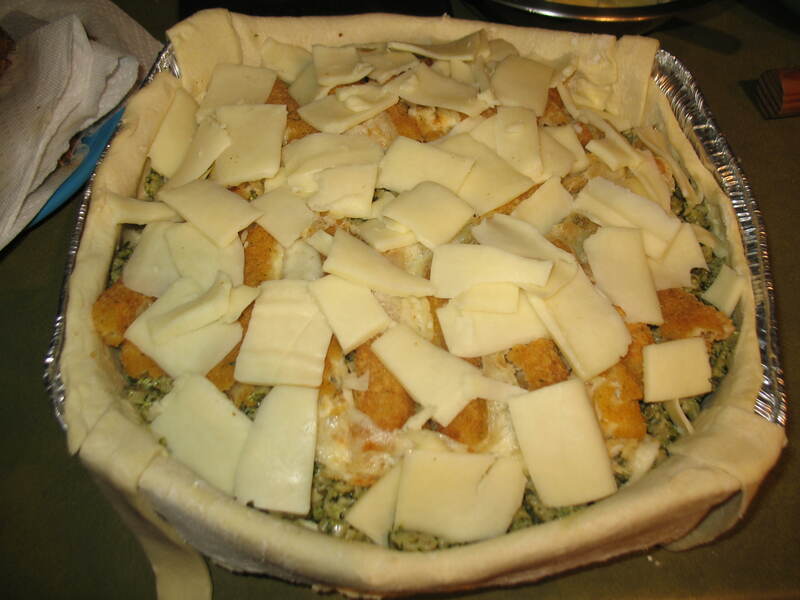 They all melted together and made a large breading and cheese mess. 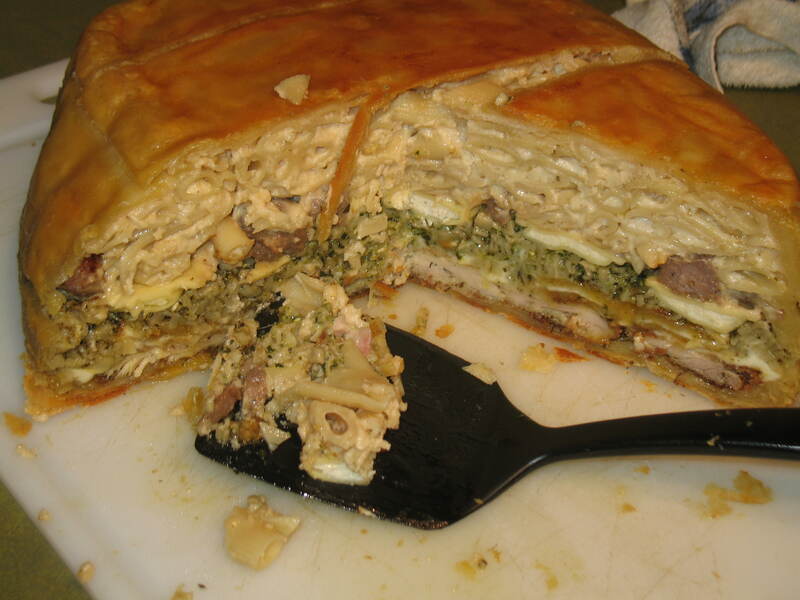 I was only able to salvage a few for the timpano. The rest went to some very happy dogs. Once everything was cooked the fun part could begin. I used FIMB’s idea of a disposable tin. 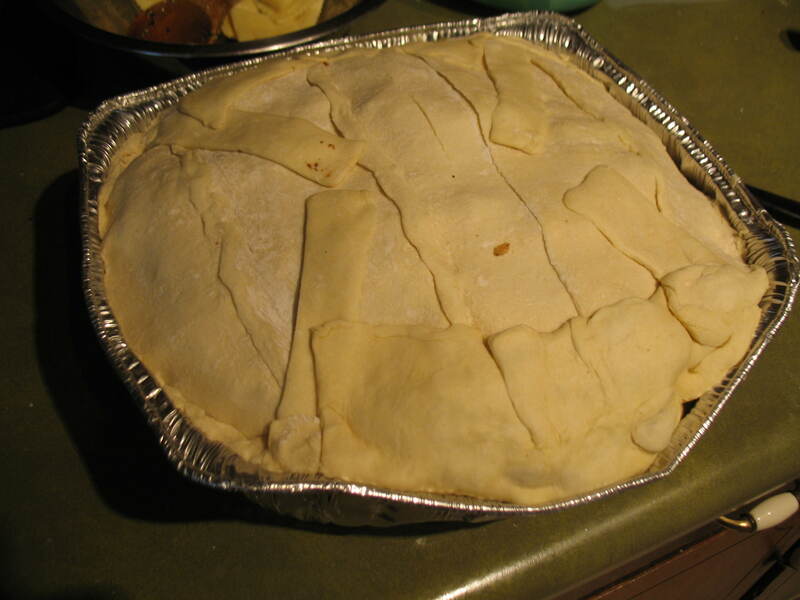 I lined it with store bought pastry dough. Trust me making your own pastry dough is a terrible lesson in futility. Store bought is easy and makes me happy. 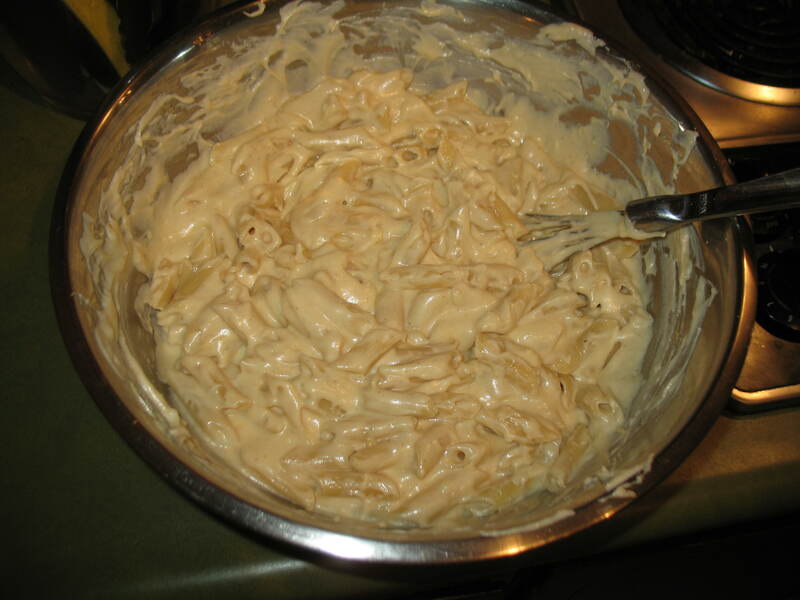 We put in the alfredo first and patted it down into the bowl. Then the sausage went in next. Then the ravioli went on top of that. The dino pesto went on top of the ravioli. 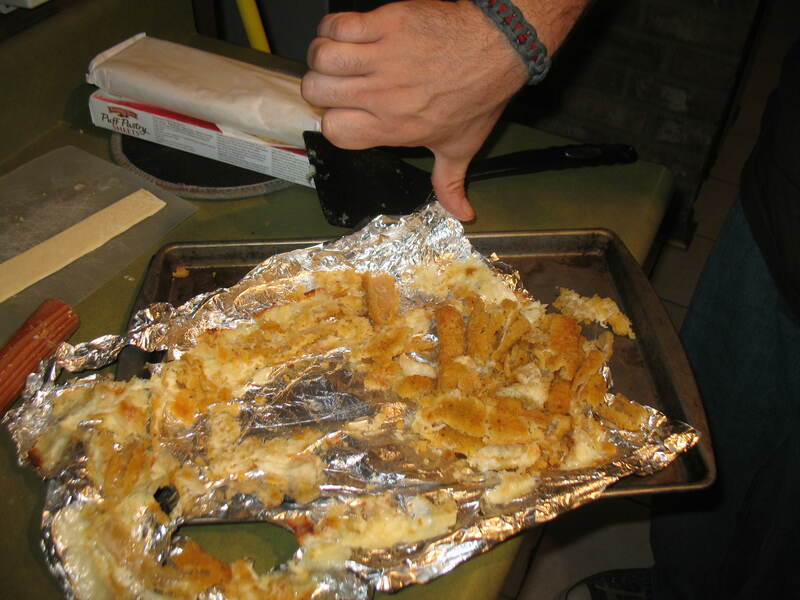 We places a few failed mozzarella sticks down with some sliced fresh mozzarella too. Last went the chicken parmesan. 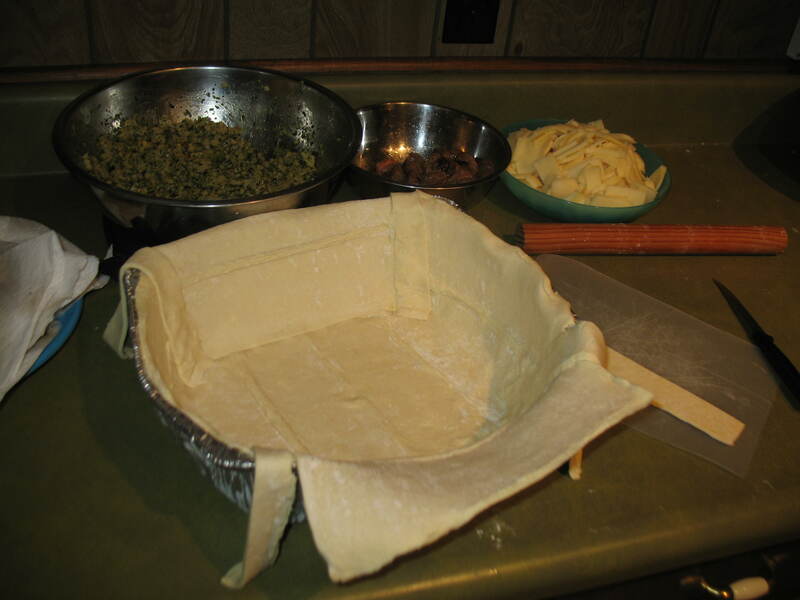 Finally, I sealed the whole thing up in more pastry dough. Make sure to press down each layer firmly to keep out pockets of air. I baked it at 350 for 1.5 hours, let it sit for about 20 minutes before cutting. T was in charge of the Epic flip. This thing weighed about 20 pounds. I had to get a bathroom scale out to weigh it because my kitchen scale couldn’t do the job. Flipping something so big is not an easy task. We all held our breath and waited. T did a flawless job! Double thumbs up for a job well done. Look at this monster! 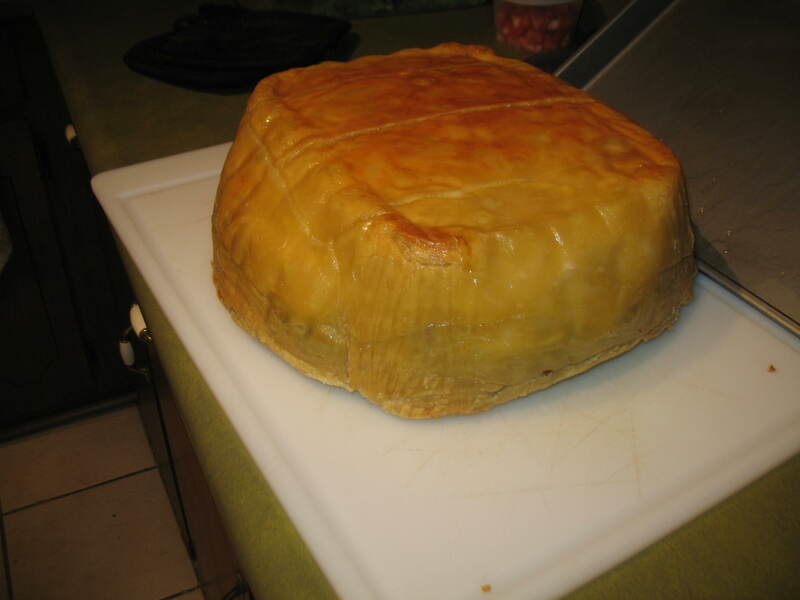 It is important to let it sit a bit before flipping and cutting so it will stay together. I cut one a little early and it wanted to collapse. It’s like Italian Inception. Layers in layers! We had to call in some reinforcements to eat this monster meal. Ryan does not look happy about this daunting task. Oh my! I ate every bit of this and it was good! 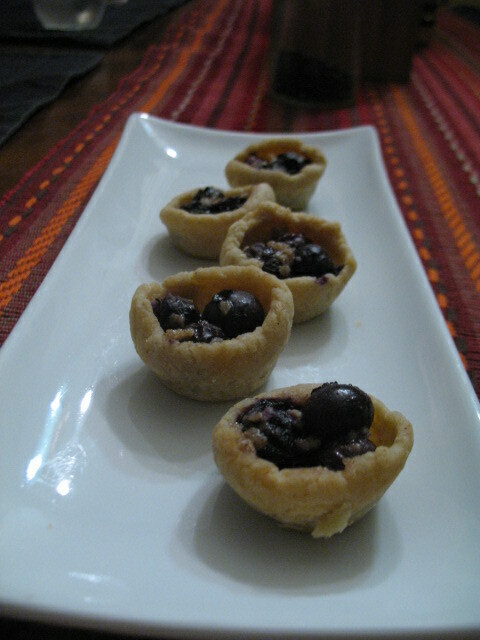 If that wasn’t enough, Karen made these cute blueberry tarts for dessert. Aren’t they adorable? We had 6 people eating this and still didn’t finish half. It was so good! If you are looking for a truly epic meal I highly suggest this one. We all then died and went to carb heaven. 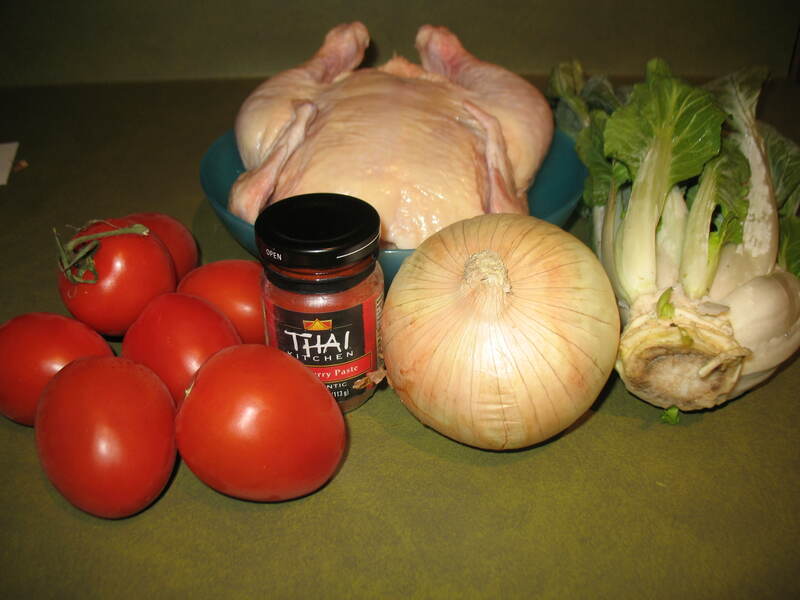 This is just a quick marinade you can use for chicken or pork (or fish if you are so inclined). 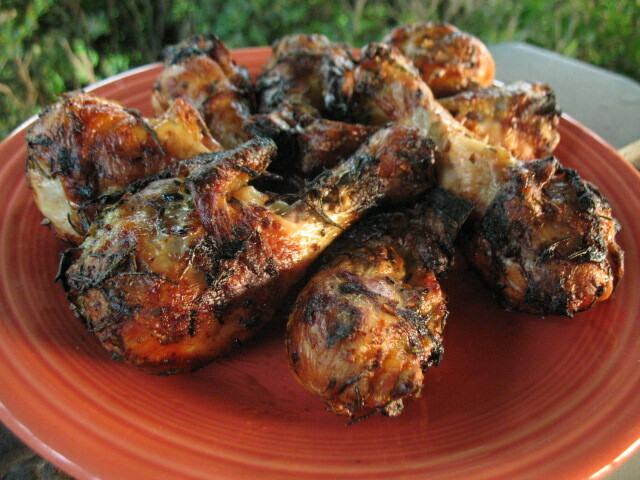 I used chicken legs and grilled it up. Marinate for a few hours. Don’t marinate this over night because of the vinegar. Grill your meat. Eat with a salad. It’s that easy. 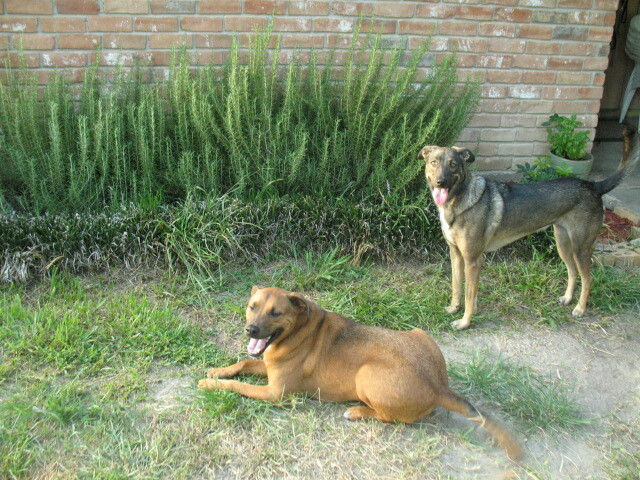 These are my rosemary bushes and the dogs. The bushes are two years old now, have survived quite a few hard freezes, and two long hot dry summers. (We are in a drought right now). They started as tiny plants and are huge now. 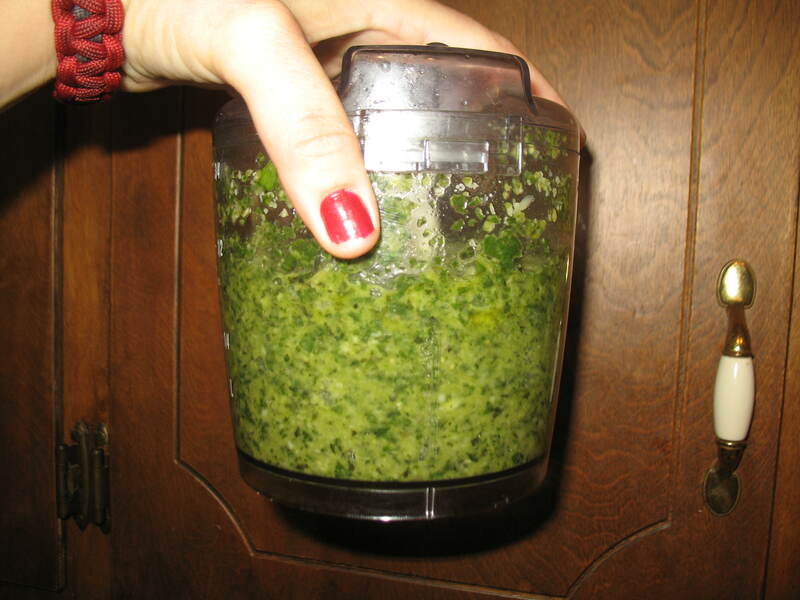 I cut sprigs off of it whenever I have guests or want to cook with it. If you live in Texas you might want to consider planting rosemary. It’s really hardy and not easily killed (which is what I need because I kill everything). I swear I’m eating more than just cookies lately. It’s just that I’m not making anything new or interesting. 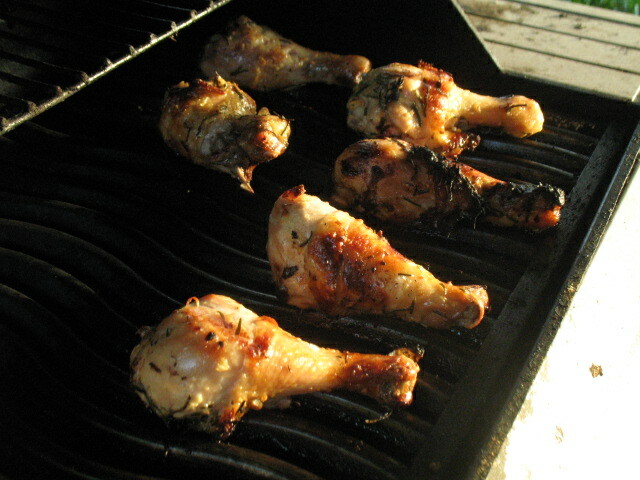 You don’t want to read about how I grilled another chicken part and had another salad. You want new, interesting ideas. That’s why I read food blogs anyways, for new ideas. I’ll assume you do the same. Today’s recipe is something new. I even have a mess to prove it! 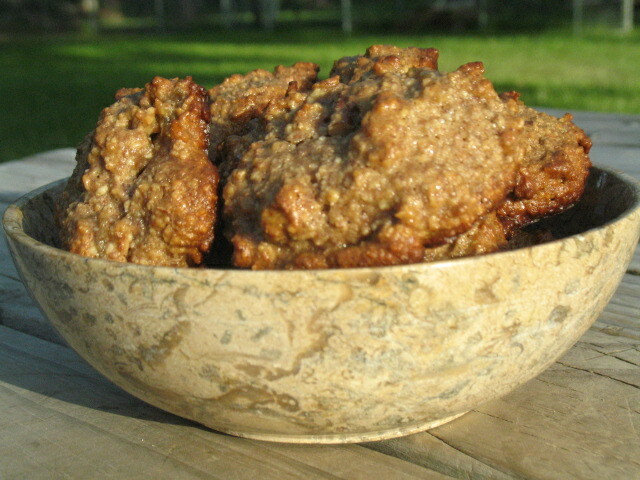 I used my last cookie recipe and made some tweaks and changed up some of the ingredients. I think I almost have a perfect cookie ratio when using nut flours. The smell in my house right now is amazing. T even liked them! He used some expletives to describe them. Process coconut, pecans, and almonds in a food processor until you’ve made a meal. It will look like sand when it’s ready. You can use regular nut flour that you bought at the store too just measure a scant cup instead. Mix flour with all remaining ingredients. Spoon dough on to greased cookie sheet (I used bacon fat, of course!) and bake at 350 for 15 min. That bowl came to me all the way from Afghanistan! Thanks Adam. Ever start a meal with good intentions and end up going out to dinner or something instead? That’s what happened here. I was going to make a roasted chicken and T came home and really wanted to go out. I figured the chicken was on low and slow, I would just let it finish cooking and eat it tomorrow instead. Well dinner turned into drinks and about 7 hours later we got home. Yes, I cooked a chicken for 7 hours. It was only at 200 so nothing was burned but it was definitely very well cooked, see also mushy vegetables. 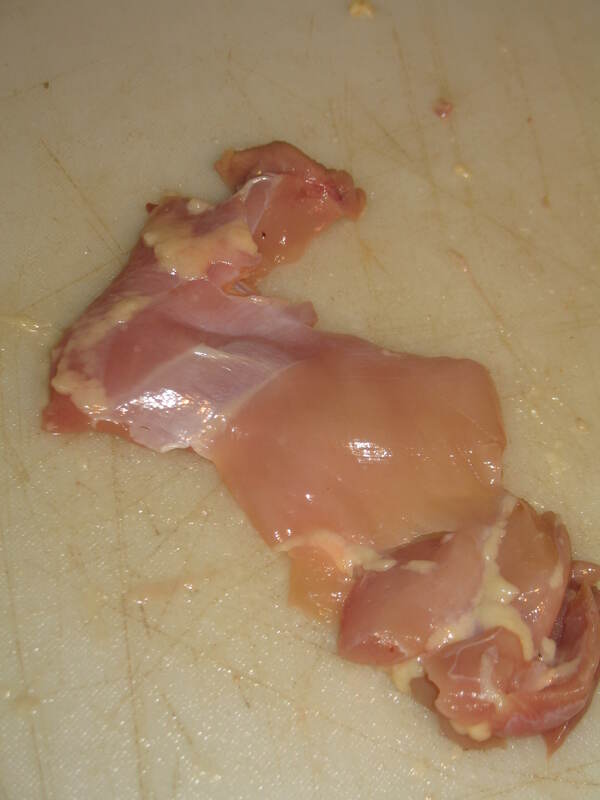 I pulled it out and the chicken fell apart. I figured I’d refrigerate it and figure it out what to do with it the next morning. I figured it wasn’t salvageable and I’d just throw it away. 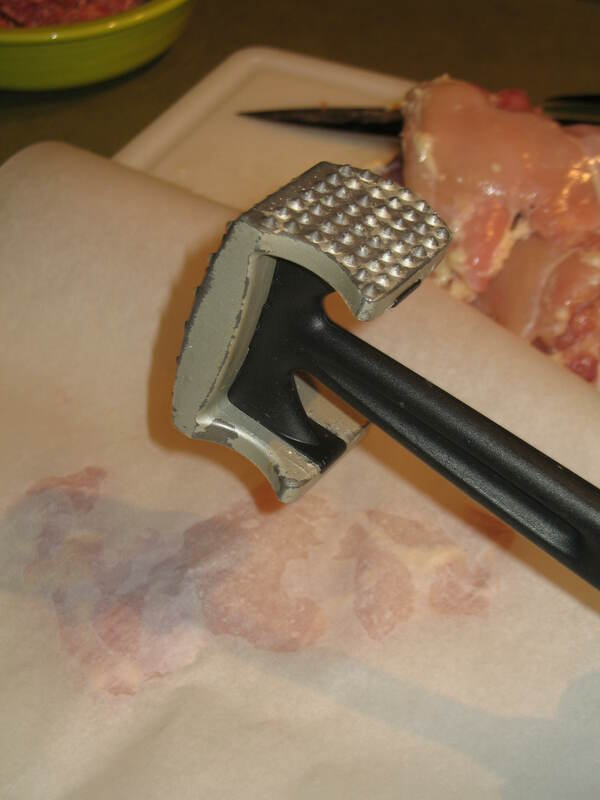 Well the next day I very carefully de-boned the chicken and discarded the skin. It was a whole chicken so I wanted to be sure not to drop a small bone back in the soupy mess where I couldn’t find it. 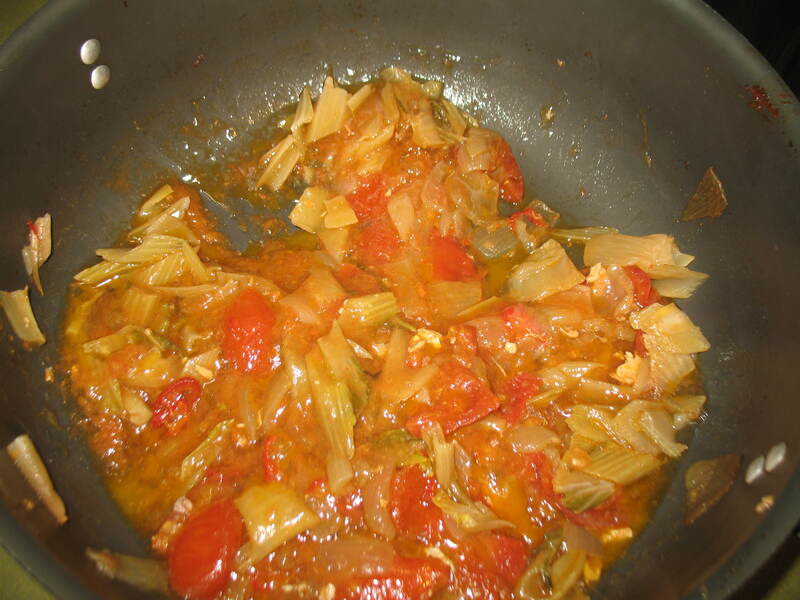 The vegetables were obviously too soft to salvage so I thought maybe I’d blend it into a sauce. I blended it up added a few more spices and it was actually not bad, something resembling tomato soup. I added the chicken back into the veggies and it was good. If it were winter time this would be a perfect comfort meal! (Add a grilled cheese sandwich for real authenticity) T even liked it. Now we were bad and had this over real rice. But, it is fine the way it is or over paleo rice. 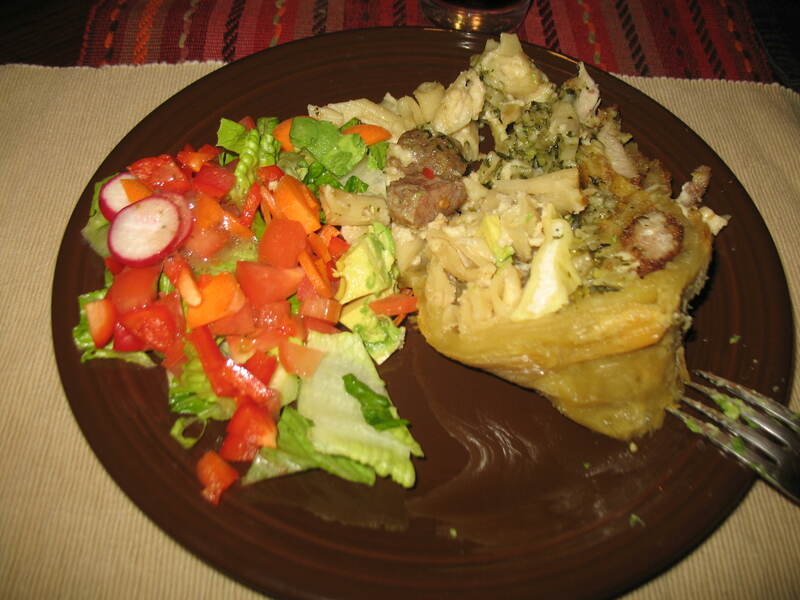 There are a lot of veggies in this meal so it is pretty good for you no matter what nutrition plan you follow. I can only approximate the measurements and time because I was pretty sure I’d end up throwing the whole thing out. 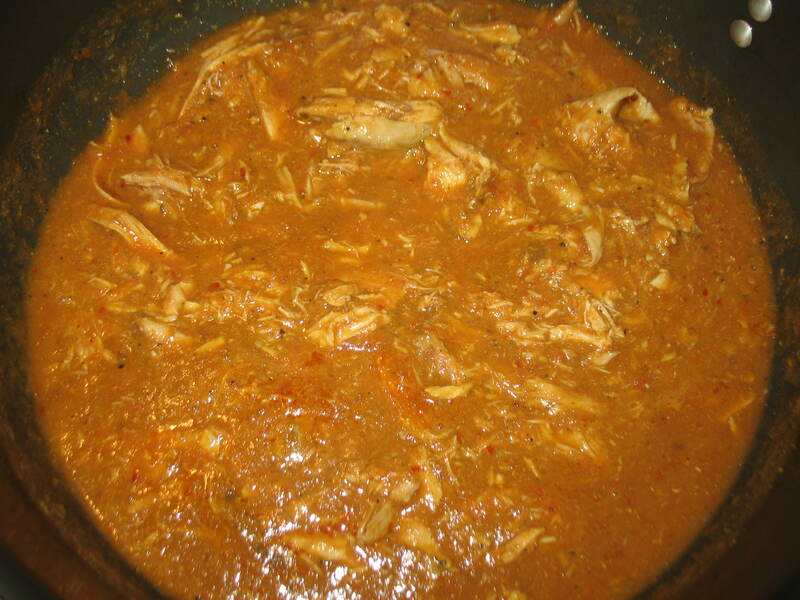 Coat chicken in 1 tbsp of curry paste. Place chicken on top of diced veggies. 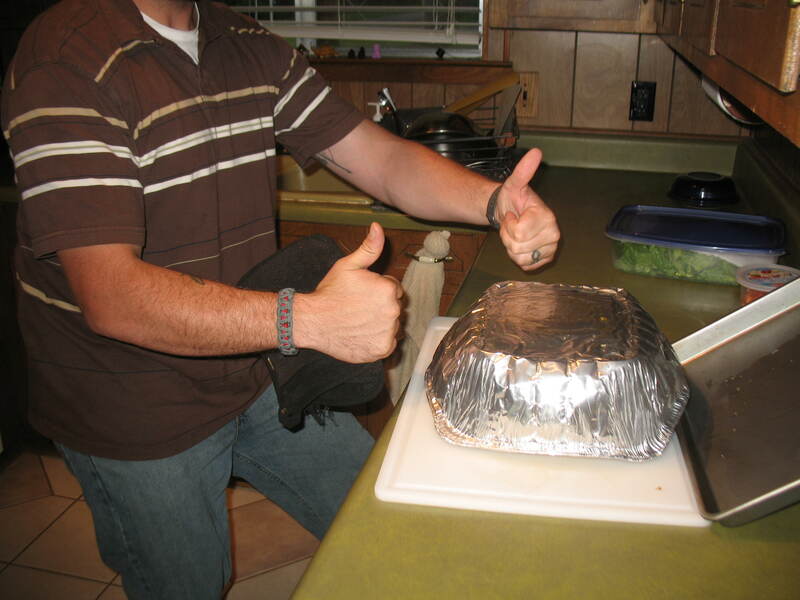 Cook covered in an oven safe pot at 200 for 3-4 hours. 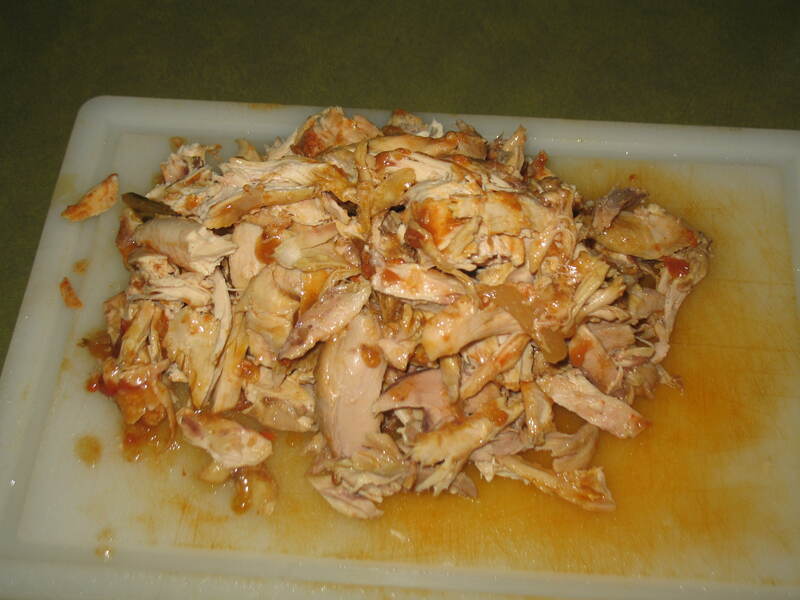 When chicken is falling apart remove from heat.Remove skin and bones and shred the chicken. Set chicken aside. 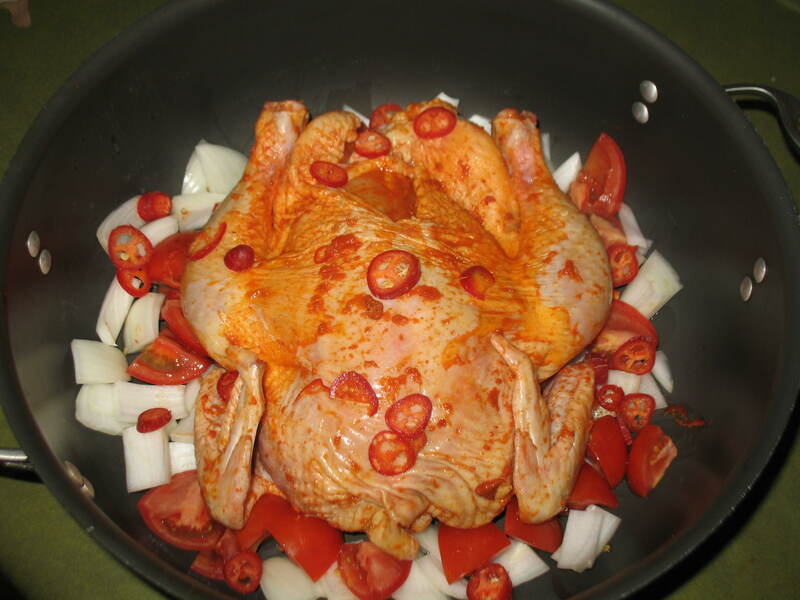 When cool, blend vegetables and whatever liquid has come from the chicken until smooth. Pour mixture back in same pot. Add remaining spices. 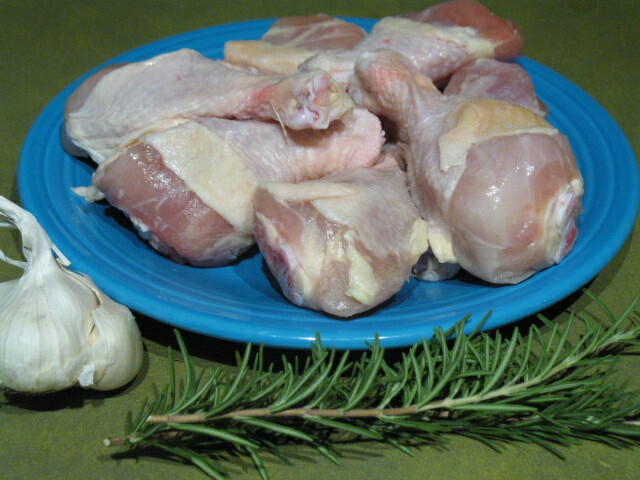 Bring liquid to a boil and add chicken. Serve as is or over the rice of your choice. Sometimes even mistakes end up okay. Have you had a similar mistake turned good? or bad? Tell me about it. 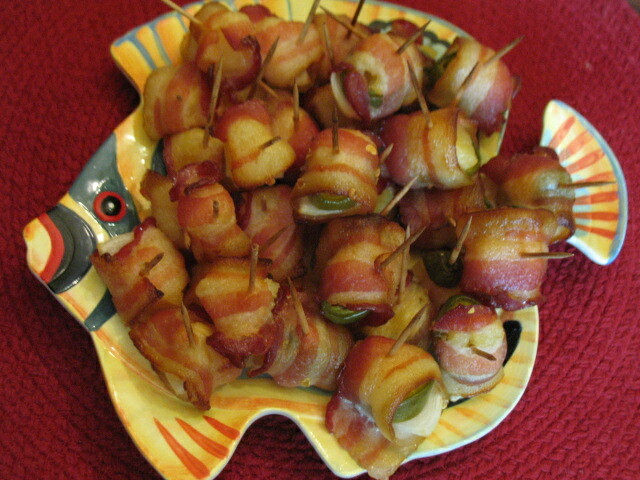 I made these for an appetizer this weekend. They are super easy and only have a few ingredients. I called them Hawaiian wraps because they remind me of a Hawaiian pizza. Oh pizza, I miss you. These are a great thing to bring to a party and are easily assembled. Cut bacon in half. I experimented with 1/4 pieces of bacon too. 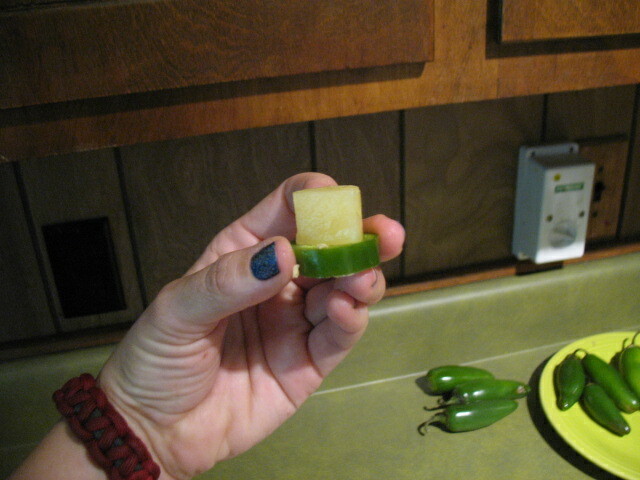 Place one piece of pineapple in a jalapeno slice. 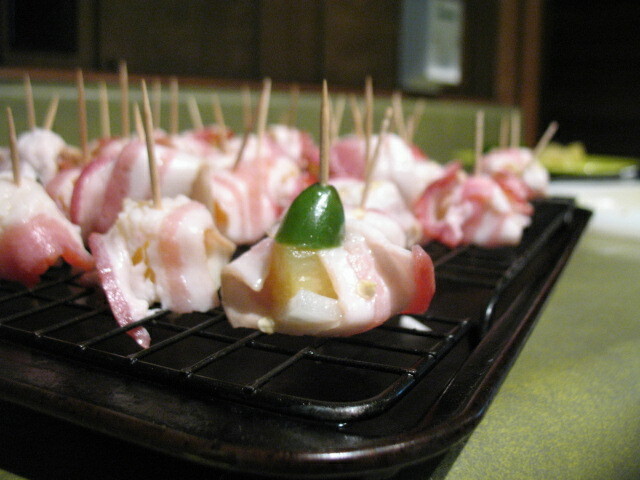 Knock out the seeds of the jalapeno for a less spicy appetizer. One thing I learned while watching The Food Network is that if you lick a cut slice of raw jalapeno you can tell the heat of that pepper. Some peppers are super duper hot while others could be eaten whole without even breaking a sweat. Tasting the cut pepper gives you an idea of its heat. If you are making these for company obviously lick the stem side that you intend to throw out. Not the cut side you are about to wrap. 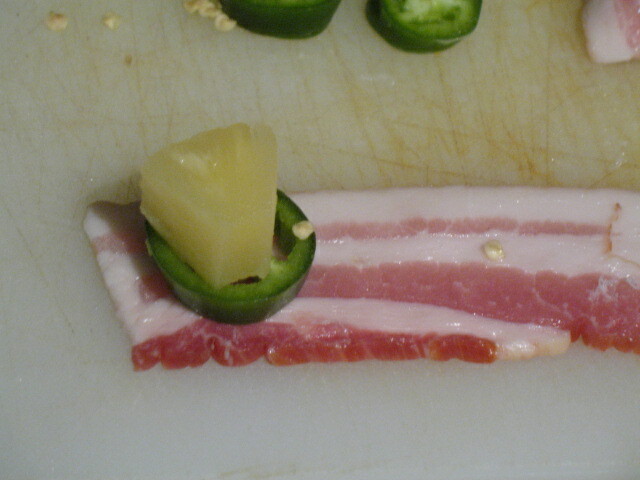 Place the jalapeno/pineapple on top of the bacon. Wrap the bacon all the way over the top and tuck under. Skewer this to hold in place. Sparkly nails are optional. 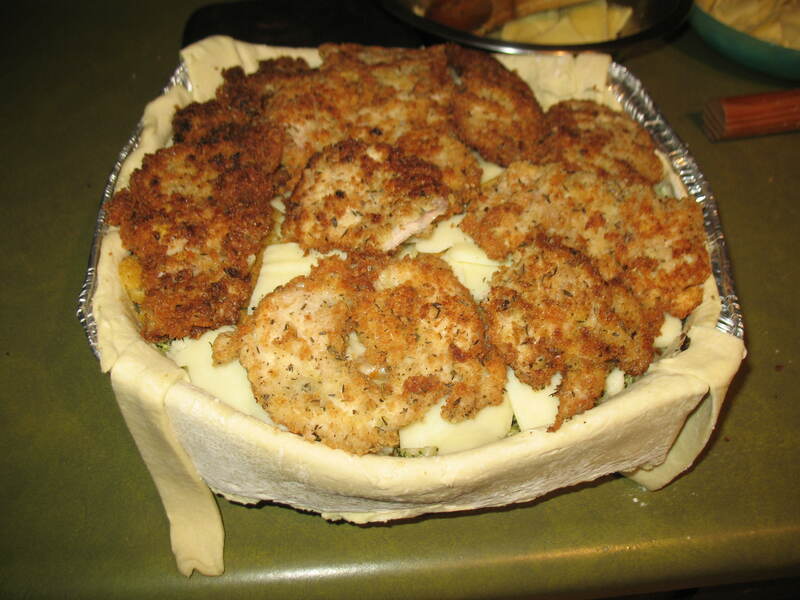 Bake on top of a baking tray with a cookie sheet underneath to catch the drippings. 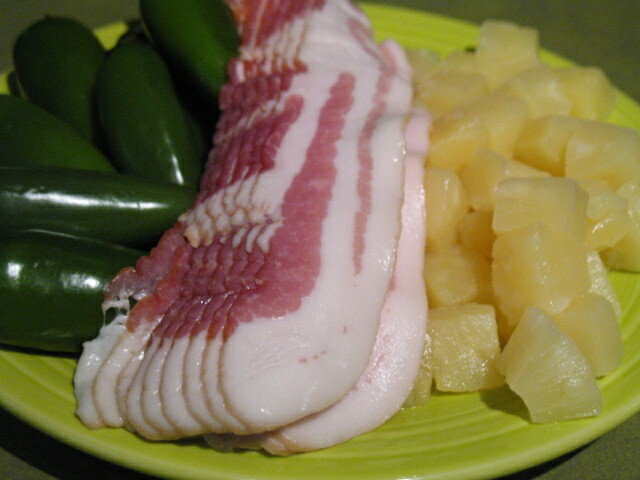 I made some with pineapple and onion, some with pineapple and jalapeno, and some with all three ingredients. 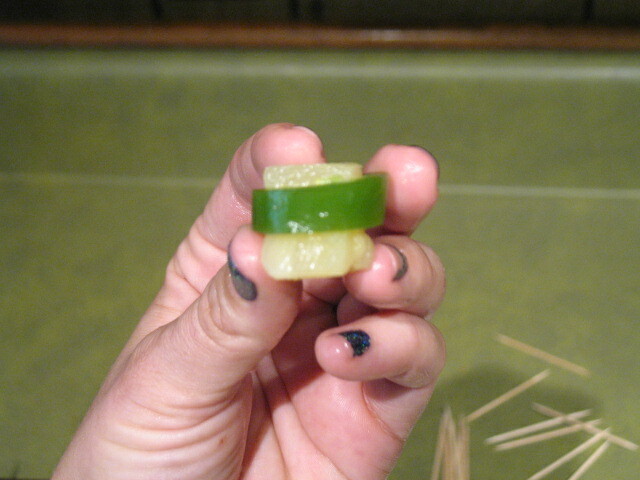 I even made ones where the jalapeno was around the pineapple like a belt. Basically I played with my food until I had no more bacon left. 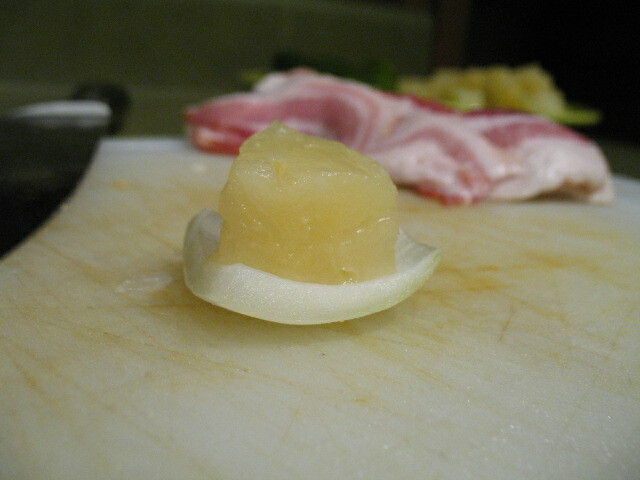 The onion/pineapple ones were small enough for a 1/4 piece of bacon. 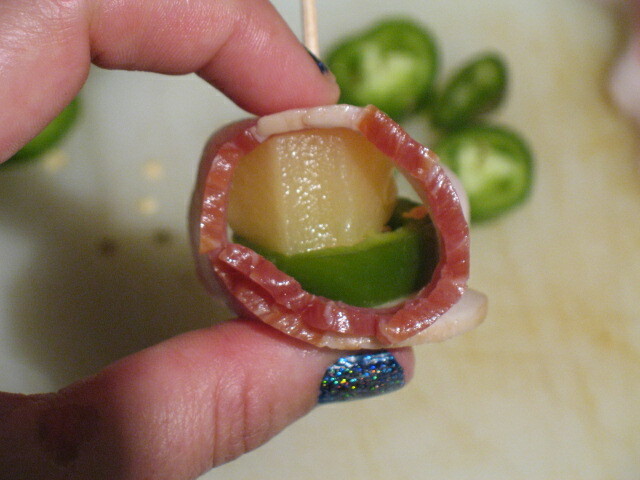 The ones with jalapeno needed 1/2 a piece of bacon. This one in the corner has a hat! I baked these in the oven at 300 until the bacon was cooked through. For me this was about 25 minutes. 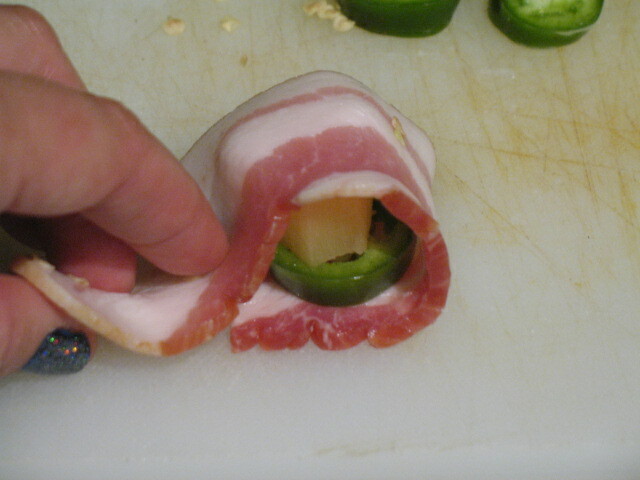 Obviously, check and make sure your bacon is done before gobbling them up. I had to wrap these up so I wouldn’t snack on them all day. A Hawaiian fish for a Hawaiian treat! I really think they had all the essential flavors of one of my favorite pizzas without the dough!